Cuddles with Katy the goat. Wow. This week has absolutely flown by – I can’t quite believe it’s Sunday again already! It’s really been a continuation of #farmlife (yes, I really did just use a hash tag in the middle of some continuous prose) here at honeycomb valley, full of fun, laughs, dirt, honey, children and animals, so I thought this week’s photo should demonstrate just that. I’ve really come to absolutely adore all these animals, from the tiniest chicken, to the biggest horse (yes even me, who’s scared of horses), with all the goats, sheep, cows and alpacas in between. 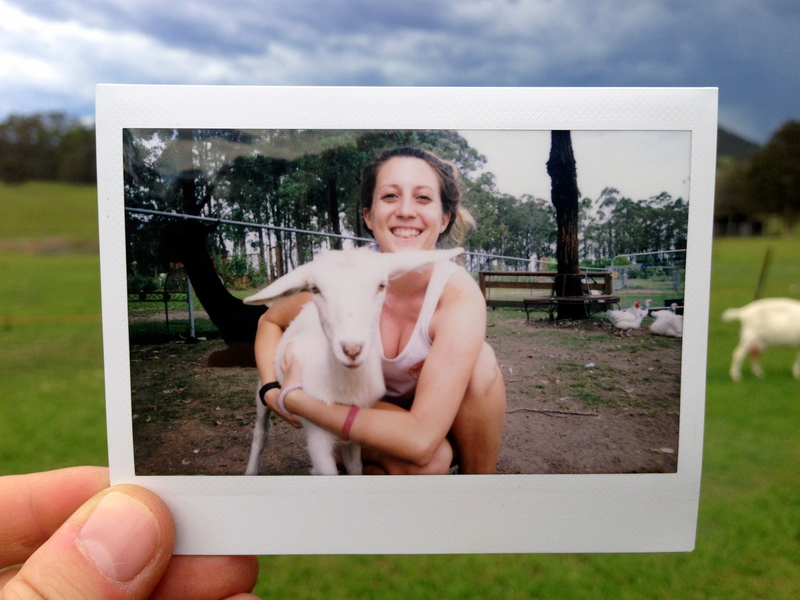 You saw my all-time favourite furry friend a few weeks ago, so I thought I’d crack the Polaroid camera out this week and take some fun pics of some more of my favs (you can find more photos on my Facebook page) – this one here is Katy, the cutest baby goat you’ll ever meet. She runs over to me whenever I go in the petting area, and gives me cuddles and kisses (which pretty much just involves her licking all the dirt and honey and sweat off my skin…yum) – who could ask for a better farm friend?